The first sign of the Zodiac; fiery, courageous, and determined. These traits fit our Aires candle well. Smokey tobacco and black pepper permeate from this jar, with bright notes of ginger and honeysuckle. May the mark of the Ram watch over you. The second sign of the Zodiac, Taurus is patient, reliable and uncompromising. With sweet rose and apple scents, and subtle notes of honey and amber, the mark of the Bull stays its course, headstrong and reliable. The third sign of the Zodiac, Gemini are gentle, curious, and adapt to change easily. The tangy scents of grapefruit and mango dance enthusiastically with notes of basil and peppermint. The elegant dance of The Twins graces you. The fourth sign of the Zodiac, those blessed by Cancer are tenacious, emotional, and persuasive. The cool scents of vanilla and cucumber mingle with the sweet undertones of tuberose, melon and pineapple. Like the Brave Crab itself, this candle is sure to strike up your imagination. The fifth sign of the Zodiac, Leo's are warmhearted, cheerful, natural born leaders. 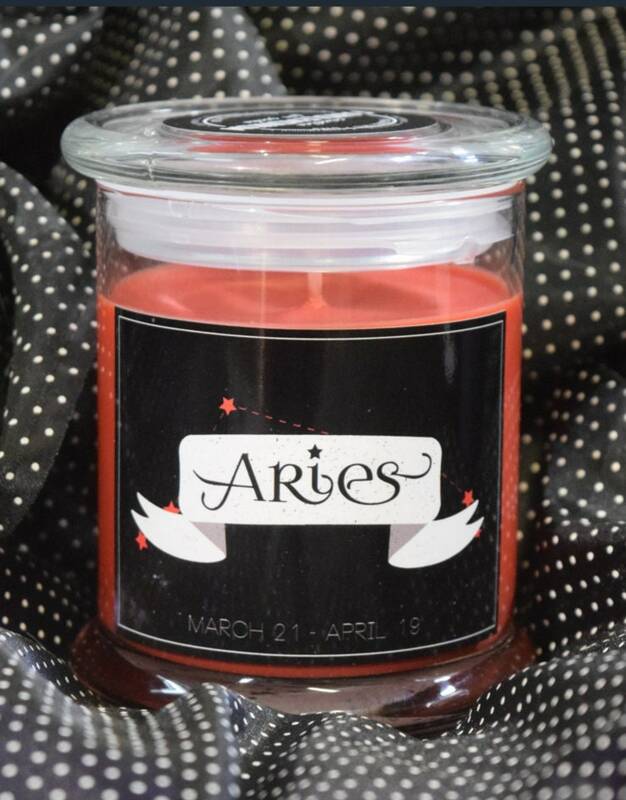 This candle takes command as well, with powerful citrus scents of orange blossom and juniper, with a warm blend of honey and chamomile to bring comfort. The mighty Lion inspires courage in others, and our candle strives to do so too. The sixth sign of the Zodiac, Virgo has been described as loyal, hard working, and kind. Flowery rose and soothing coconut take center stage here, with light notes of vanilla and cardamom. The Virgin Goddess smiles on those who are diligent and kind. The seventh sign of the Zodiac, cooperation, harmony, and justice are core to Libra's beliefs. A medley of strawberry and raspberries find themselves weighted against the floral notes of lily and geranium. Balance in all things is what the Scales of Justice strive for, and a balance of scents is what we've tried to achieve. The eighth sign of the Zodiac, Scorpios are resourceful, secretive, and passionate. This candle fills the room with the sweet,spicy aromas of mulled wine and coriander, and earthy undertones of patchouli and leather. The fierce Scorpion pierces swift, and our candle captures that ferocity well. The ninth sign of the Zodiac. Freedom, generosity and idealism are key traits of Sagittarius. The pungent scent of anise strikes first in this candle, followed by a wave of mulberry, nutmeg, clove and sandalwood. Aiming high and striking true is what Sagittarius strives for. The tenth sign of the Zodiac, Capricorn are naturally responsible and well disciplined. Soothing chamomile and woodsy aspen scents cloud your senses, and the herbal scents of sage, vetiver and basil follow suit. We only hope the Goat doesn't strike fear into your heart. The eleventh sign of the Zodiac. Deep thinking and independent, Aquarius goes through life helping those in need and seeking knowledge. Calming ocean breeze and gardenia coupled with eucalyptus, bergamot and tangerine are sure to help stimulate your own thinking. May you be as free flowing as water and equally as uncompromising. The twelfth sign of the Zodiac. Pisces are compassionate, gentle and wise, friendly souls. With the crisp scents of water lily and water lotus, sweet lychee and guava, these scents go swimmingly together and create a comforting atmosphere.